Summer is finally upon us, and with it comes many fun things such as a trip to the beach, late night movies in the park, long car rides and outdoor barbecues with friends and neighbors. Your dog is an important part of the family, there’s a good chance that you’ll want to include him in these festivities. But before you hit the beach or head out to the cookout, make sure you’ve got all of your supplies for summer fun for your pet. From safety items to a little bit of fun, here’s a list of 10 great things you can get for your dog for this summer! Does your lawn need a little water? A doggy drencher can make this mundane task quite entertaining. You can water the lawn and watch your water-loving dog splash and chomp at the streams of water spraying from the drencher. Traditional sprinklers are fun for some dogs, but look for a product that is designed as a doggie sprinkler or drencher, because this will have just the right amount of water flow and water height for your dog’s enjoyment. Pro-Tip: Choose a sprinkler or drencher designed for the size of dog you have, as smaller dogs need a smaller water height than bigger breeds. If your dog loves water, then you’ll probably spend quite a bit of time at the lake or beach. 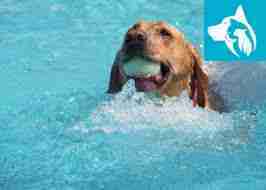 So why not turn water play into exercise and fun for your dog? Playing fetch on the water takes the game to a whole new level, but you need the right ball. A ball that’s received a few puncture marks from eager teeth is going to sink rather than float. Instead, look for a floating ball that will stay above water. Pro-Tip: You can use something simple like a tennis ball, or you can buy a ball specifically designed for water-based play for your dog! No matter where your summer fun takes you, you need to be certain that your dog is well hydrated. A water bottle with a dispenser attached is perfect for water on the go. Just fill the bottle and cap it tightly, then use the included dispenser to pour your pup a drink. 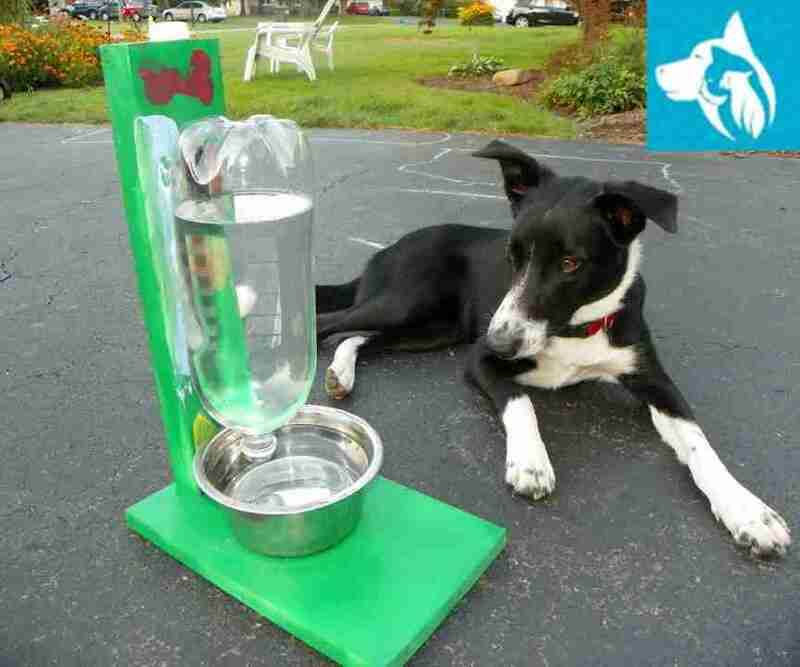 No more wasted water trying to pour some into your dog’s waiting mouth. Warning: Dogs can dehydrate easily in the summer. It is important to remember that your dog needs roughly 8.5 to 17 ounces of water per 10 pounds of weight every single day, so plan accordingly. A bandana is more than just a fashion accessory for your dog in the summer. If your dog seems to get too hot, you can use a bandana to help him cool off. Simply soak the bandana in cool water, then tie it loosely on your dog’s neck for an instant cooling effect. You can do this with a simple bandana, or you can buy cooling bandanas made specifically for this purpose. Warning: Dogs can’t sweat, so you need to help your dog stay cool on hot summer days with cooling products like bandanas. The Pawstick is an all-natural balm for your pet’s feet to help add another layer of protection against hot pavement or rocks. It can help provide healing for pads that are cut or cracked, and it’s completely natural. This means your dog can lick his paws without fear of toxins. It’s made from things like essential oils (dog-safe of course), vitamin E and beeswax. Remember: Apply Pawstick before walks on hot days to add more protection for your dog’s pads, and always check for irritation after long walks. If you’re heading to the lake or even the backyard pool, your dog may want to join you. Yet dogs can tire quickly, so provide your pet with a cool place to take a break with a doggie raft. The smaller size and more durable materials of these floating rafts make them perfect for your pooch. Pro-Tip: Choose a raft that is made of a material that’s durable enough to avoid puncture damage from your dog’s claws. Is your dog a Frisbee fanatic? Plastic discs can be cumbersome in the water, because they get pulled under and are hard to swim with. Choose a wet Frisbee, which is a soft Frisbee designed specifically for wet play, and take your dog’s favorite game to the beach as well as the park or the local neighborhood picnic. Did you know that the temperature of the blacktop in your neighborhood can easily exceed 130 degrees on a 95 degree day? This is hot enough to burn your pet’s paws in just one minute of contact. If you live in a hot climate or want to enjoy an afternoon walk on a warm summer day, protect your dog’s paws from burns with dog shoes designed for summer wear. Pro-Tip: Choose a spot where your dog can walk in the grass. Even with shoes, blacktop and cement are quite hot and dangerous for your pet, but grass is much cooler. Did you know dogs can get sunburned too? Dogs with light coats or dogs with areas of short hair, like on erect ears or exposed tummies, are particularly vulnerable, but all dogs can burn. Sunscreen is important! When lathering up your pooch with sunscreen, don’t forget his nose, which is his most vulnerable part. We’ve also covered this important topic in our other blog about how to keep your dog cool this summer. Warning: Use sunscreen for dogs, not humans, as the ingredients in human sunscreen are dangerous for dogs if they lick it off of their skin. Maybe you make specialty treats on Christmas or during Thanksgiving, but why not design some new treats for this summer season? Nothing can complete a season better than seasonal treats! Some design shapes are: beach balls, the sun, or even an umbrella. Give some summer treats to your furry friend after a fun, long day at the beach.